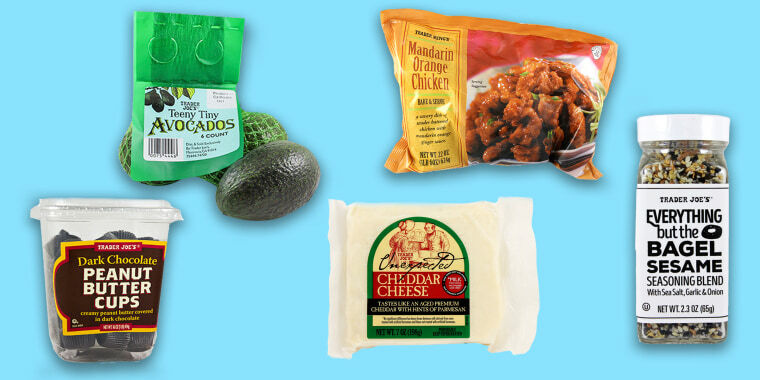 Trader Joe's annual Customer Choice Awards are basically like the Oscars of the food world. Well, maybe that's more like the James Beard Foundation Awards. But still. Let's face it, the national grocery chain known for its affordable prices has a pretty rabid fanbase. Some folks have even gotten engaged in the store's cozy aisles. This year, Trader Joe's is celebrating its 10th year of surveying customers about their favorite in-store items, and they even switched around some categories. The powers that be added "Favorite Meat" to the list and axed "Favorite Coffee" — last year it was cold brew, obviously. "Favorite Pumpkin" was also replaced with "Favorite Seasonal" to give more holiday and springtime treats a little time to shine. Some all-time favorites held their ground as customers' top choices, while others got booted from the spotlight. This frozen dish won best entrée and all-around favorite item this year ... and last year ... and the year before that. Inspired by Chinese-American takeout, this easy-prep meal consists of breaded chicken with a stir-in sauce of orange peels, fresh ginger, garlic, green onions and soy sauce. The runners up in this category included the new cult-favorite Cauliflower Gnocchi, Everything But The Bagel Seasoning, Dark Chocolate Peanut Butter Cups and Unexpected Cheddar cheese. This hot dip aced being an appetizer. With so many pre-made frozen appetizers at TJ's, this category is a doozy. It even shifted from last year's winner, Spanakopita (don't worry, that dish is still the first runner-up). Other runner ups are Pastry Bites with Feta & Caramelized Onions, Vegetable Bird's Nests and Parmesan Pastry Pups. OK, we get the hint: now it's time to throw a party. This almond ring-shaped pastry with icing made by O&H Danish Bakery took first place for another year. Trader Joe's Sliced French Brioche, Chocolate Brooklyn Babka, Sliced Sourdough Bread and Vegan Banana Bread were all fan favorites, too. Spiced cider, which is only sold during the fall, got bumped to second place this year. It was replaced by the oh-so-trendy but classic Sparkling Mineral Water. Customers couldn't choose a particular flavor, though, so everything from plain to lemon took the top honor. Triple Ginger Brew, Spiced Cider (last year's all-star), Charles Shaw Wines (because who can resist that "two-buck Chuck?") and Brewed Ginger Beer were runners up. These delightful chocolate candies won in 2017 and 2018, as well. It can be pretty hard to resist eating the whole 1-pound package as they're salty, sweet with just the right amount of bitterness from the rich chocolate flavor. Scandinavian Swimmers (basically the chain's version of Swedish Fish), Sea Salt & Turbinado Sugar Dark Chocolate Almonds, Dark Chocolate Covered Almonds and Dark Chocolate Sea Salt Caramels were customers' other top choices. Another repeat winner, this cheaper cheddar tastes anything but, well, cheap. It's the kind of cheese where the little salt crystals are still present. It's creamy and great on its own, or melted into a gorgeous grilled cheese. In 2018, plenty of people also enjoyed the Coastal Syrah Toscano, French Brie, Cheddar with Caramelized Onions and Triple Crème Brie. The country's top condiment of choice shifted from organic ketchup to Everything But The Bagel Seasoning Blend. This salty and slightly spicy seasoning is incredibly versatile and really tastes like an everything bagel! It can be used to season tasty dips, create a savory yogurt breakfast or even add spice to meats and fish. Other favorite condiments included Blue Cheese Mustard (seasonal), Green Dragon Hot Sauce, Organic Ketchup and Sweet Chili Sauce. It's hard to resist these perfectly portion-controlled desserts. It has the cone, the vanilla ice cream and the chocolate sauce all in one. Plus, their tiny size makes them pretty adorable. Runners-up: Macaron Variés, Gone Bananas, Chocolate Lava Cakes and Key Lime Pie. Last year's favorite produce, bananas, still cost just 19 cents but that great price point wasn't enough to beat the essential ingredient in everyone's new favorite brunch item: avocado toast. These little beauties are mini versions of the green-fleshed fruit everyone knows and loves. These are everyone's favorite snack for three years in a row and we can see why. Peanut butter and pretzels are a pretty classic combo and this savory snack puts them together in a cute little package. The runners-up included Roasted Plantain Chips, Organic Corn Chip Dippers, World's Puffiest White Cheddar and Bamba. Whether you're trying a vegan diet or just looking to cut down on animal proteins overall, the soy chorizo meat substitute makes a killer taco or a great breakfast side. Other winners included the ever-popular Cauliflower Gnocchi, Kale, Cashew & Basil Pesto, Vegan Tikka Masala and Quinoa Cowboy Veggie Burgers. This vegetarian-friendly meal option slayed the competition for Trader Joe's other "Favorite Crew Member lunch" category. Runners Up: Rainbow Wrap, Chicken Tikka Masala, Tofu Spring Rolls and Mediterranean Style Orzo Pasta Salad. This pre-marinated meat is a great one for the barbecue and TJ's fans love it. Runners-up include Lemon Rosemary Spatchcocked Chicken, Chicken Shawarma Thighs, Applewood Smoked Bacon and Turkey Meatballs. Candy Cane Joe Joe's, which are akin to peppermint-flavored Oreos, took the lead for seasonal faves. The classic combination of chocolate and mint isn't too much of a shocker. The runners-up were Chocolate Covered Candy Cane Joe-Joe's, Jingle Jangle, Mini Mint Stars and Pumpkin Bread & Muffin Mix.